There are few who brave such hardships as we poor grinders do." 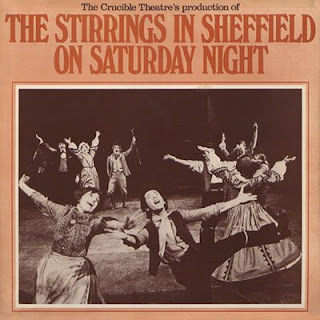 The Stirrings in Sheffield on a Saturday Night was premiered at the Sheffield Playhouse in 1966 and enjoyed several successful runs both there and later at the new Crucible Theatre. Most of the songs in the play were traditional set to music by Roderick Horn. This LP recording comes from the 1973 Crucible production starring Richard Wordsworth and Fanny Carby. The play tells the story of William Broadhead and 'the rattenings' (sometimes known as The Sheffield Outrages), the struggle between The Saw Grinder's Union and non-union labour culminating in the murder of a non-union worker. Eventually a government board of enquiry was set up to investigate the grinding trade and it's working conditions. This LP may be of limited interest to many but it is essential for anyone who has ever had any connection with Sheffield. Jeesh, I'm having trouble keeping up with all this lovely stuff you know! Not to mention the hard drive space that is forever needing additions. Back to the ripping !! I also have connection to Sheffield, through the soles of my shoes! I arrived in the mid-seventies but never knew this existed. Thanks Reynardine, fantastic. I saw the original production at the Playhouse, when I lived in Sheffield 30 years ago. I'm now miles away from my home town, and have been looking for a decent copy of this recording since my wife recorded over a tape that I had made from a friend's copy. Great for the nostalgia-fest! I was taken to this in 1973, aged 10, and still remember it. We had the EP with Sheffield Grinder song on it- I must have played it a thousand times and still know all the words. It started my interest in Sheffield history. I'm struggling to download the audio though. I'd love to hear it again. I went to see it in the early 70's and had the LP at the time but later lost it. I'd love to get a copy of the songs but as with Paul above the download doesn't seem to work anymore. Has anyone got a copy they could send me? I should be able to sort something out as I have recorded the Playhouse EP and the Crucible LP onto my computer, and from there onto my ipod. Contact me on paul@orton.com.